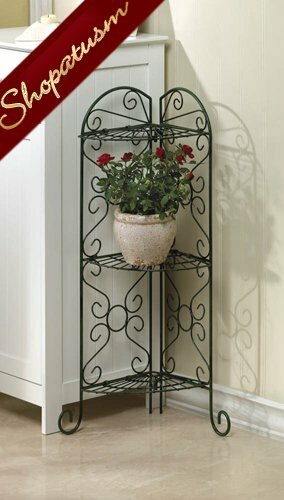 This is for a Antiqued Faux-Verdigris Corner Plant Stand 3 Shelves from Shopatusm. Antiqued faux-verdigris plant stand is designed to fit into any corner; three shelves provide ample room for plants or display items. Metal. Assembly required. Each shelf is 12 1/2 inch across, 9 inch deep; overall item is 30 1/4 inch high.